With the increasing activity and development on all fronts, the District Courts including Civil Courts at Nagpur have also been expanded and at present these are housed in different barracks and small structures built progressively from as early as 1866 right up to 1957. The average size of the Court hall at present is hardly 600 sq. ft. with a Judges chamber of about 150 sq.ft. and various verandahs are being used for general public waiting purposes. The present accommodation was found to be too meager for the actual needs of the courts and the other facilities available were also found to be inadequate. The Magistrates’ Courts were located in a small room with a curtain used in a corner for the chamber. The general public was also greatly inconvenienced in absence of proper waiting halls and other allied facilities. 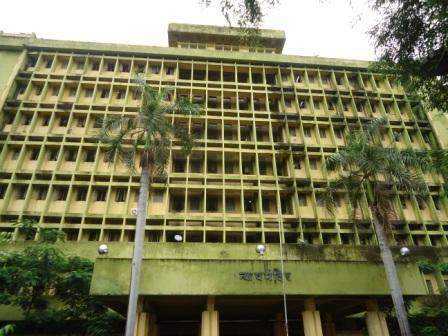 In order to mitigate the hardships and to fulfill the need, the Government of Maharashtra decided in 1970 to have a single Court Building of adequate size with all modern Courts functioning in Nagpur and their future expansion. The actual work of the building with ground and 8 upper floors was started on 19th February 1971 at the hands of Hon’ble Shri S.P. Kotwal the then Chief Justice, Maharashtra. Having regard to the general location of other offices and convenience to the public, the plot available in the present compound of the Courts in the Civil in the Civil Lines area, was found to be ideal for housing this new building. The site is easily approachable from various parts of the city and is surrounded by important Government offices such as All India Radio, D.D.A. & P.T. Office, Collector and Commissioner Office, etc. The building has been planned for 53 Nos. of Courts functioning simultaneously, taking into consideration the additional 3 Nos. of Court which will come into existence in near future. This is a multistoried framed structure having nine floors. Three wings in ‘H’ Shape have been planned in the Building. There are 7 lifts, out of which four lifts of 13 persons capacity each, will be available to the general public and balance three lifts of 4 persons capacity each, is earmarked for exclusive use by Judges. In addition there are six staircases out of which the Judges earmarks three for use exclusively. The location of Judges chamber is so arranged that from Judges lift or staircase there is a direct access to his chamber. GROUND FLOOR : Carpet area=2,264sq.m. FIRST FLOOR : Carpet area= 2,193sq.m. SECOND FLOOR : Carpet area= 2,193sq.m. THIRD FLOOR : Carpet area= 2,193sq.m. FOURTH FLOOR : Carpet area=2,193 sq.m.